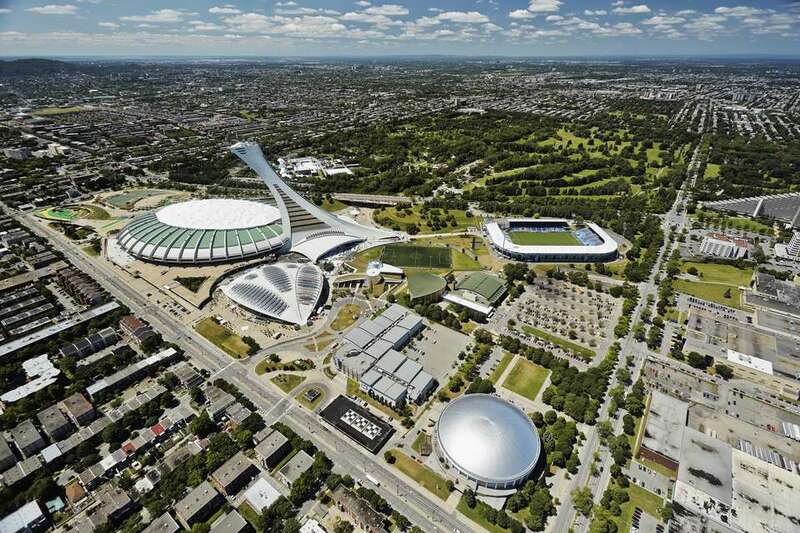 You'd think finding five places to eat near Montreal's Olympic Park is easy. It's a popular destination with both tourists and locals, but it's not exactly downtown. ​Located at the confluence of Rosemont and Hochelaga-Maisonneuve, two traditionally working class neighborhoods slowly but surely gentrifying with every passing condo project, Montreal's Olympic Park features a concentration of the city's most popular attractions, notably the Montreal Biodome and across the street, the Montreal Botanical Garden. Yet the area is still largely residential and it can be a bit tricky figuring out where to eat when unfamiliar with the lay of the land. Even seasoned Montrealers catching a show at the Olympic Stadium or major league soccer match at nearby Saputo Stadium aren't always sure where to go. Options in and around the Olympic Park are limited. Good, but limited. The first Friday of every month May through October, Montreal food trucks gather in the Olympic Park Esplanade from 4 p.m. to 11 p.m. selling a variety of haute comfort dishes and desserts to the tune of live music. Outside of First Fridays, outdoor bars and food stands are a regular feature of the Esplanade's winter village and summer events. But there's no guarantee that a stand will be open the day you drop by. For choice coffee, soup, salad, sandwiches, and pastries, head to Café In Vivo. Open year-round, it's situated right within the Olympic Park itself. Warmer months feature a terrace. Finally, the Montreal Botanical Garden restaurant serves cold and hot dishes, including vegetarian fare. In the spring and summer, sit on the terrace overlooking the grounds. It's one of the most beautiful patios in Montreal. Select summer evenings feature live jazz and drink specials. Wine is competitively-priced. To get a taste of local life, take a 20-minute walk southwest of the Montreal Botanical Garden (or hop in a cab) to get to Promenade Masson, an off-the-beaten-path shopping destination roughly one dozen blocks long in the heart of Montreal's Rosemont neighborhood. See map. Keep an eye out for Pot Masson, a restaurant/café/cocktail bar on the promenade with unbeatable deals courtesy of its $4.90 breakfast, lunch, and dinner menus. Salads, melted brie dishes, unique burgers, original poutines, and assorted international dishes round out offerings, somewhat tapas-sized given the price. Themes change with the seasons. One week might feature sausage sauerkraut poutine, beef curry, or artichoke and zucchini tempura. Yet another week could propose Italian meatball poutine, kale salad with walnuts, and maybe salmon burgers. Vegetarian-friendly dishes are a mainstay on the menu. Items off the $4.90 menu are also affordable. Think paella for two for $15, or a fish tartare duo made to share for $16, depending on the week. Check this week's menu for the latest scoop. Specialty coffees, happy hour beer specials, and elaborate cocktails served in mason jars complement the experience. Walk another three blocks west on Masson for some of the best barbecue in Montreal. A smokehouse serving Southern-style American cuisine, try Le Boucan's house-smoked brisket, ribs, and the 5 napkin burger's 8 ounces of beef topped with 12-hour smoked bacon, cheese, and BBQ sauce. Vegetarians? Le Boucan's (very) shortlist of veggie-friendly options include Bruche Végé, a weekend brunch dish composed of toast, fried black beans, Mexican cheese with lime and cilantro, fried plantain, fried green tomatoes, poblano, and habanero sauce. A less than 15-minute walk from the Olympic Stadium going south leads to poutine heaven in iconic working class neighborhood Hochelaga-Maisonneuve. Poutine Centrale serves over 20 different kinds of poutine, including one concocted with butter chicken, another with pulled pork, and vegetarian versions as well, notably with sesame sauce and falafel. Breakfast poutines are topped with eggs, bacon, and sausage. Try Centrale's homemade pogos while you're there. Drink specials are de rigueur. Think $5 beer pints. For something a little more upscale yet casual, family-friendly, and within budget, walk 15 minutes east of the Olympic Park to reach Bagatelle Bistro. Some say it's the best restaurant in the neighborhood. Elegantly-plated classic French bistro fare—duck magret, steak and fish tartares, filet mignon, foie gras, crème brulée—is a running theme. Vegetarian options are few. The lunchtime grilled veggies and feta sandwich springs to mind. No alcohol is served on location, which allows patrons to save on drink markups and bring their own wine or bubbly to lunch, dinner, or even breakfast. An SAQ liquor store is conveniently located a less than five-minute walk from the bistro. Plan a trip to Marché Maisonneuve, one of Montreal's largest public markets, while you're there. It's right beside Bagatelle. Open seven days a week as early as 8 a.m. for breakfast, keep in mind that Bagatelle Bistro closes at 2:30 p.m. after lunch, reopening for dinner at 5 p.m. Dinner reservations are strongly recommended given the bistro's popularity.